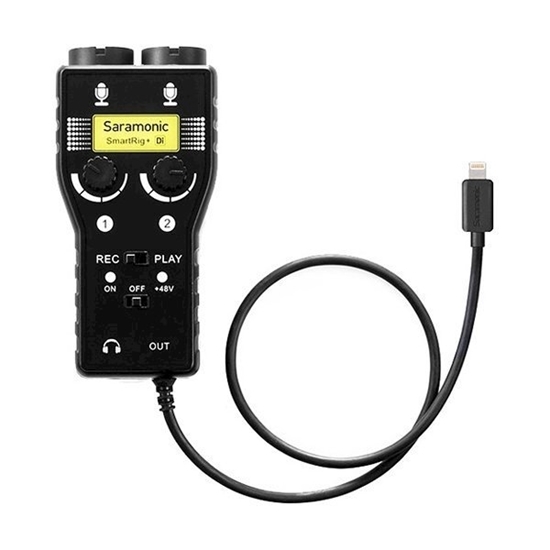 The Saramonic SmartRig+ Di is a two channel audio interface. It allows you to connect professional microphones/guitars to record quality sound or create music with your iPhone, iPad and iPod touch. The Lightning connector allows you to record great stereo sound to your iOS devices. The SmartRig+ Di makes your recording work much easier. It provides 48V phantom power for microphones and 3.5mm headphone output for real-time monitoring. The two gain control thumbwheels make it easy to set levels of each channel separately.